Hello, my name is Matthew Capala.I lived in Lodz, Poland until the age of 23. I moved to New York 10 years ago, where I’ve led several lives: construction, scaffold operator, bus boy, waiter, Internet marketer, trainer, entrepreneur, professor, and executive. In that order. I chose myself. You can too. Online entrepreneurship, personal branding, and social media enabled me to create opportunities thatI would have not otherwise have. How do you draw a line between your business name and your personal brand? Steve Jobs built Apple, not the other way around. You have built your own company, You Inc. However, being a founder is much different from being a CEO. The first is a hobby, the latter is a job. The Internet and social media have democratized marketing on the Internet. Online influence is earned, you cannot buy it. How do I compete with big brands who have multimillion dollar marketing budget? You cannot compete with big brands for eyeballs on TV, but you can on YouTube. Every individual is a media company so you need to act like one to get ahead of the pack, and soon to survive. In a world where 80% of consumers Google a product or service before purchasing it, invisibility is a fate much worse than failure. Whoever you are and whatever you do, your number one job is to build your credibility on the Internet through native content and socialconnections. I call it the 3 Cs of Bootstrap Marketing: Credibility, Content, Connections. 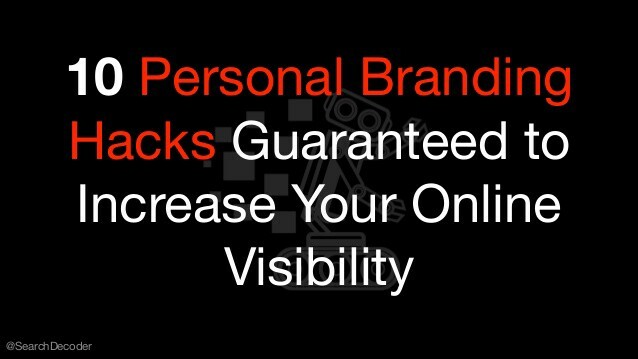 Here is your playbook for personal branding on the Internet. Click the ‘enter full screen’ icon in the lower right corner of the screen to view the deck. You can also view it on SlideShare. The best way to get a hold of me is on Twitter — just tweet at me if you have any questions: @SearchDecoder. It looks like your last 10 years sine you left Lodz were a great study in inner strength and resilience. Congratulations! Great insights! This article could help entrepreneurs to build their personal brand. Building your personal brand is important in business. Because people want to do business with other people, not with companies. Putting a strong personal brand on the frontline of your sales process can dramatically improve conversion rates.